We shall commemorate the glourious past of Bratislava this year with a series of events. Together with Austria and Hungary, Bratislava will take part in celebrating the 302th anniversary of the birth of Maria Theresa, one of the most famous people in the history, who was crowned in Bratislava in 1741. Let yourself immerse in the rich royal history during the Bratislava Coronation Days and enjoy the coronation of Maximilian II Habsburg. In addition to this program, you can go sightseeing or join historical tours of the city under the baton of the Guild of Old Martial Arts and Crafts. You can also enjoy the Coronation Concert in St. Martin’s Cathedral of the Bratislava City Choir. Take part in period coronations and “Become a Royal” yourself at the Coronation Photo Video Point at the ground floor of Michael’s Gate. Michael’s Gate was an integral part of the coronation route followed by the kings who were crowned in Pressburg as they left the city to where they would take their oath. The Coronation Photo Video Point is where you will find rooms with period furnishings and an authentic 3D model of the historical city marking the route coronation processions took. You can make an image and upload a video of yourself in period costume with the coronation insignia and become a part of a historical exposition. You can record both a photograph and video displaying a scene from the coronation and then print or share it with your friends through e-mail. Under the auspices of the Municipality of the Capital City of Bratislava, and in cooperation with municipal institutions Bratislava Culture and Information Center (BKIS), Bratislava Tourist Board, Bratislava City Gallery, Bratislava City Museum, The Bratislava City Library, Bratislava City Archive, the city of Bratislava prepares varied programme of different genres for diverse audiences with the coronation theme. Residents and visitors to the city will be able to enjoy the coronation atmosphere through cultural events, theater performances, concerts of sacred music, worship, period music and games. Those interested in finding out more about the history of the coronation will be able to receive regular guided tours in English, German and Hungarian organized by the Bratislava Tourist Board’s Tourist Information Center. The route will tour the most important sites associated with the ceremony of coronation of Hungarian rulers and their wives. 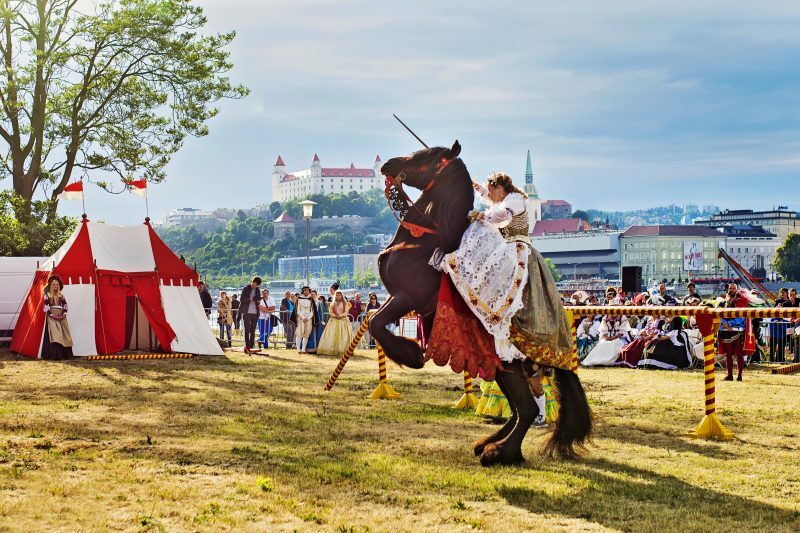 It will also be the opportunity to learn more about the places associated with the reign of Maria Theresa during which Bratislava went through an unprecedented economic and cultural boom. Furthermore, you will be able participate in an encryption game replicating the coronation route during which the participants move from task to task with the use of QR codes.